Thank you for standing with us as we persevere with our efforts to promote a culture of honour and honouring for the well-being of Singapore in business, in social relationships, and in the lives of many Singaporeans. The past quarter has been fruitful for the team at Honour (Singapore). We organised the 5th Honour CEO Forum which was attended by some 60 leaders of businesses and organisations. 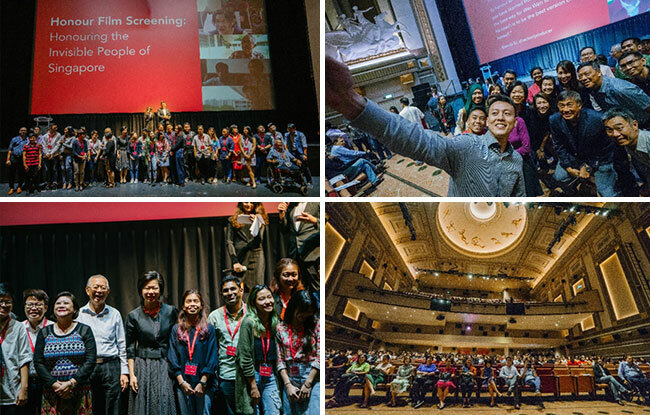 We organised the 6th Honour Film Screening with an audience of around 550 guests who pre-viewed five Honour films which will be released online through the honour.sg website and Honour (Singapore) Facebook page. This quarterly newsletter serves to update you on critical Honour events and speaks of our upcoming landmark event, the Honour International Symposium. The Symposium will be held on 19 – 20 July 2018 in Singapore with the theme “Be The Best You Can Be.” We seek to have everyone be the best we can be, first by honouring our individual talents and abilities, and then in applying honour in family relationships, community relationships, leadership relationships, and business relationships, and in that way help build secure, stable and sustainable success in work and life. The Symposium will begin with the Welcome Dinner on 19 July 2018 where our Guest of Honour, Mdm Halimah Yacob, President of the Republic of Singapore, will deliver the opening address. It will be followed by a full day of discussions on 20 July 2018. Mr Tan Min-Liang, Co-Founder & CEO of Razer Inc will speak at lunch, and the closing dinner will feature Mr Hannes Schmid, world-famous Swiss photographer and artist, and founder of Smiling Gecko, a social enterprise in Cambodia that has created new futures for the homeless and helpless. Please click here to see the exciting programme and the list of distinguished speakers. We have only a few seats left for the Symposium, so please contact us immediately if you can make the time to come. This is a great opportunity to learn from our distinguished speakers whose life lessons and experience will help you develop your talents and abilities, build strong families and relationships, create success in business and leadership, and help all of us with ideas on winning in work and in life! The Honour International Symposium is a biennial symposium that brings together established leaders and future leaders in business, government, and community groups to discuss issues of honour and honouring for successful business, stable homes, and strong nations. This follows our inaugural symposium organised in 2016 where Mr Jack Ma, Founder of Alibaba, gave a thoughtful and inspiring video message which you can view here for an indication of what Honour International Symposium 2018 can offer you. If you are interested to attend HIS2018, please get in touch with us at info@honourinternational.sg. Participation is by invitation only and seats are limited. Honour Film Initiative: We continue to support young-adult filmmakers and student filmmakers from Ngee Ann Polytechnic in producing short films and documentaries on the theme of Honour and Honouring. Our films have garnered well over seven million cumulative online views with numerous positive and encouraging comments. We invite you to watch and share these highly emotive and inspirational films at http://honour.sg/short-films/ or on www.Facebook.com/HonourOurSingapore. If you are similarly inspired by the 20+ Honour films you can find on the internet, do introduce them to others and pass these springs of life on. Learning Journey: Following the successful introduction of our Learning Journey Programme in 2016, we have connected with 13 schools and reached out to over 3,500 students and 80 educators. Through the highly energised facilitated sessions, the students were able to better understand the importance of Honour for work and life, and gained practical insights on ways of living it out in their own lives. If you are an educator and you would like to explore the use of our films in values education, please get in touch with us at admin@honour.sg. HONOUR IN ACTION: Honour (Singapore) is working on a pilot programme we tentatively call HONOUR IN ACTION, where the practice of Honour, in its multiplicity of expressions, may become a natural part of the way we live and the way we are. If being a Gracious Society becomes a dominant characteristic of Singapore, we would be mining the “HIDDEN WEALTH OF SINGAPORE” where the quality of relationships among the people will enhance both economic growth as well as establish a social environment conducive to every child and every Singaporean developing their talents and abilities the best way possible. This idea is well described by David Halpern in his book “The Hidden Wealth of Nations” (Polity Press). Such a work of social transformation may take a generation, which is why we need people with the vision, resilience, patience and conviction to come on the journey. If you would like to participate in the pilot programme and are a school leader, please write me at LimSiongGuan@honour.sg to express your interest. CEO Forum: The CEO Forum is a periodic forum that we organise to bring together leaders of organisations, big and small, to share perspectives on Honour and discuss how Honour could be beneficial to their organisations. If you are a CEO and would like to attend one of these forums, please get in touch with me at LimSiongGuan@honour.sg to express your interest. Honour Champions Community: We welcome all who are prepared and convicted to lead as Honour Champions in their respective organisations and other spheres of influence, to contact us so we can meet to discuss how you joining a Chapter of the Honour Champions Community can be useful and encouraging. Our belief is that the culture of Honour promoted through Honour Champions and Honour Ambassadors will not just be critical for Singapore’s continuing survival and success as a nation, but also is critical for the survival and success of our businesses and families, and our effectiveness as leaders and workers for the future. Do write me at LimSiongGuan@honour.sg if you are keen to be involved. Thought Leadership: I had the opportunity to speak at Methodist Girls School (Primary and Secondary) on the topic ‘Keeping a culture of honour at MGS’. About 300 people attended the event, comprising school leaders, staff, student leaders, members of the parent support group and alumni. I shared on the criticality of honour and honouring for the long-term success of Singapore. I was also invited to speak at a uniform group’s leadership conference where I shared some thoughts for long-term sustainable success for the future, emphasising that honour and trustworthiness are critical aspects for success in work and in life. Talks: I continue to speak on the subject of Honour, on an invitation-only basis, at schools, companies, and community groups. These occasions inspire and energize me, as I also hope they inspire and energize the audiences. Thank you very much for your generous support and encouragement for Honour (Singapore). Should you have any ideas and feedback, please get in touch with me at LimSiongGuan@honour.sg. And should you wish to support our efforts financially, your donations, whether large or small, will always be welcome and deeply appreciated. We are a charity with status as an Institution of Public Character, which means donations from individuals as well as corporate organisations may enjoy enhanced tax deductibility.